In his short theory-fiction PJ Ennis imagines a crypto-world or rather post-crypto-world of the 31st century depicted through the perspectives of three prisoners. Among other things it offers a concise history of monetary theories as new religions/ideologies. 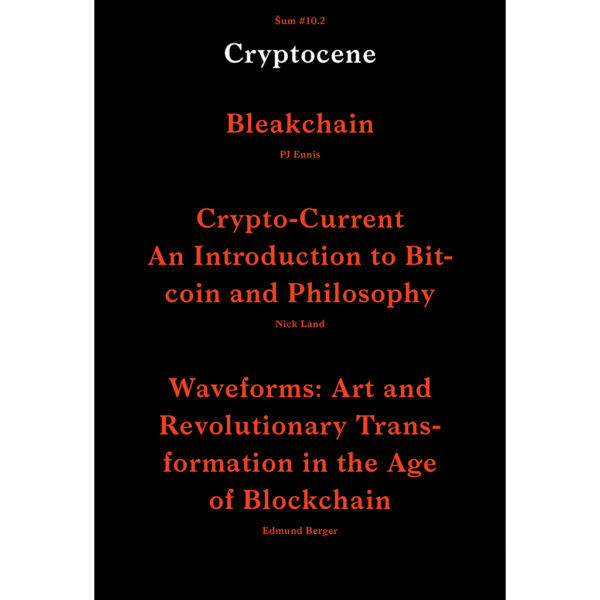 Nick Land’s text is the 1st chapter of his book Crypto-Current dealing with bitcoin and philosophy that he has been working on for several years. This is the first time a part of the book is published. Its initial hypothesis is that Satoshi Nakamoto’s brief document, i.e. 64 words that launched bitcoin, will in the future have the status of a pre-Socratic fragment, which will be endlessly dissected by philosophical schools. Edmund Berger discusses blockchain in terms of long-term economic cycles and speculates whether it constitutes a new techno-economic and thereby aesthetico-political paradigm. The text aims to reclaim modernity and open up an alternative modernity that breaks with the past in order to achieve a New Reality Principle, that is, New Reason. Print: Demat, d. o. o. Realized in the framework of State Machines, a joint project by Aksioma (SI), Drugo more (HR), Furtherfield (UK), Institute of Network Cultures (NL) and NeMe (CY).